Ronald Wilson Reagan (February 6, 1911 – June 5, 2004) was the 40th President of the United States (1981–1989) and the 33rd Governor of California (1967–1975). At age 69, he was the oldest man ever to be elected President of the United States. Before entering politics, Reagan was a successful Hollywood and television actor, head of the Screen Actors Guild, and a spokesman for General Electric. He was a prominent New Dealer in the 1940s but by 1960 Reagan became staunch conservative and advocate of free markets. He strongly opposed communism and socialism, and as president he pursued policies for fewer regulations, lower taxes, free trade agreements and welfare reform. Reagan's persuasive quotable speaking style earned Reagan the title "The Great Communicator". His ability to survive several scandals and an assassination attempt earned him the name "the Teflon President". His legacies include restoring America's strength and prosperity following a period of stagflation in the wake of the Watergate scandal and the withdrawal from Vietnam, reaffirming America's commitment to free market economics, large budget deficits, rejecting Détente and escalating the Cold War with the Soviet Union through a military build-up and firm foreign policies, and peacefully ending the Cold War with Mikhail Gorbachev, including a massive reduction in nuclear arms. Notable appointments included Supreme Court Justice Sandra Day O'Connor, who was the first woman appointed to the Supreme Court in history, and Federal Reserve Chairman Alan Greenspan. After leaving office, Reagan wrote a well-received autobiography titled An American Life. In several recent ratings of American presidents, Ronald Reagan ranked high. After suffering from Alzheimer's disease for at least a decade, he died in 2004 at the age of 93 in Bel-Air, California. He is the 2nd longest-living president in U.S. history, just behind Gerald Ford. Reagan was born on February 11, 1911, in an apartment above a bank in Tampico, Illinois. He was the second of two sons born to John Edward Reagan (1883–1941), an Irish American Catholic, and Nelle Clyde Wilson (1883–1962), who was of Scottish, Canadian and English descent and a member of the Disciples of Christ. His older brother was Neil Reagan (1908–1996). His paternal great-grandfather, Michael Reagan, came to the United States from Ballyporeen, County Tipperary, Ireland, in the 1860s, and the rest of his paternal family immigrated from Ireland in the 1800s as well. Prior to his immigration, the family name was spelled Regan. His maternal great-grandfather, John Wilson, immigrated to the United States from Paisley, Scotland, in the 1840s and married Jane Blue, a Canadian from Queens, New Brunswick. Reagan's maternal grandmother, Mary Anne Elsey, was born in Epsom, Surrey, England. Reagan's mother was an active Protestant and his father was a Catholic who rarely attended church. Reagan was raised in the Christian Church (Disciples of Christ) faith and attended a church school, Eureka College. Reagan's father was probably a problem drinker and was sporadically unemployed. Reagan's family lived in several small Illinois towns and, briefly, Chicago during Reagan's earliest years. In 1920, when Reagan was nine years old, the Reagan family settled in the town of Dixon, Illinois, with 10,000 people. The midwestern "small universe" made a lasting impression on Reagan "where I learned standards and values that would guide me the rest of my life," Reagan recounted in his autobiography An American Life. "I grew up observing how the love and common sense of purpose that unites families is one of the most powerful glues on earth and that it can help them overcome the greatest adversities," he wrote. "I learned that hard work is an essential part of life - that by and large, you don't get something for nothing - and that America was a place that offered unlimited opportunity to those who did work hard. I learned to admire risk takers and entrepreneurs, be they farmers or small merchants, who went to work and took risks to build something for themselves and their children, pushing at the boundaries of their lives to make them better. I have always wondered at this American marvel." In Dixon, Reagan attended Mount Lebanon school district and Dixon High School, where he developed a gift for storytelling and acting. These abilities led to his selection as one of the freshman speakers during the late-night meeting prior to the student strike at Eureka College. In 1926 Reagan began work as a lifeguard at Lowell Park, near Dixon. He was credited with saving 77 lives during the seven summers he worked there. In 1932, after graduating from Eureka (B.A. in economics and sociology), Reagan worked at radio stations WOC in Davenport, Iowa, and then WHO in Des Moines as an announcer for Chicago Cubs baseball games, getting only the bare outlines of the game from a ticker and relying on his imagination to flesh out the game. Once, during the ninth inning of a game, the wire went dead but Reagan smoothly improvised a fictional play-by-play (in which hitters on both teams fouled off numerous pitches) until the wire was restored. In 1937, when in California to cover spring training for the Chicago Cubs as a Headline radio announcer, Reagan took a screen test that led to a seven-year contract with the Warner Brothers studio. Reagan's clear voice, easy-going manner, and athletic physique made him popular with audiences; the majority of his screen roles were as the leading man, beginning with "B" films and carrying on through "A" films. His first screen credit was the starring role in the 1937 movie Love Is On the Air. By the end of 1939, he had appeared in 19 films. Before Santa Fe Trail in 1940, he played the role of George "The Gipper" Gipp in the film Knute Rockne, All American. From this role he acquired the nickname the Gipper, which he retained the rest of his life. Reagan considered his best acting work to have been in Kings Row (1942). He played the part of a young man whose legs were amputated. He used a line he spoke in this film, "Where's the rest of me? ", as the title for his autobiography. Other notable Reagan films include International Squadron, Tennessee's Partner, Hellcats of the Navy, This Is the Army, The Hasty Heart, Hong Kong, The Winning Team, Bedtime for Bonzo, Cattle Queen of Montana, Storm Warning, The Killers (1964 remake), and Prisoner of War movie. His many leading ladies included Jane Wyman, Priscilla Lane, Ann Sheridan, Viveca Lindfors, Patricia Neal, Barbara Stanwyck, Rhonda Fleming, Ginger Rogers, Doris Day, Nancy Davis, and Angie Dickinson. He has a star on the Hollywood Walk of Fame. Reagan was commissioned as a reserve officer in the Army in 1935. In November 1941, Reagan was called up but disqualified for combat duty because of his astigmatism. After the attack on Pearl Harbor, Lieutenant Reagan was activated and assigned to the First Motion Picture Unit in the United States Army Air Forces, which made training and education films, where his acting experience could be put to work with the war effort on film. Reagan admired the leadership skills of Franklin D. Roosevelt during World War II and emulated his powerful speeches, such as the Four Freedoms and Arsenal of Democracy. Reagan later crafted his role as President of the United States partly on his careful observations of Roosevelt's communication style. Reagan's remained in Hollywood for the duration of the war. Ronald Reagan visiting Nancy Reagan on the set of her movie Donovan's Brain, 1953. Reagan's film roles became fewer in the late 1950s; he moved to television as a host and frequent performer for General Electric Theater. Reagan appeared in over 50 television dramas. Reagan served as the president of the Screen Actors Guild (SAG) from 1947 until 1952, and again from 1959 to 1960. In 1952, a Hollywood dispute raged over his granting of a SAG blanket waiver to MCA, which allowed it to both represent and employ talent for its burgeoning TV franchises. He went from host and program supervisor of General Electric Theater to producing and claiming an equity stake in the TV show itself. At one point in the late 1950s, Reagan was earning approximately $125,000 per year ($800,000 in 2006 dollars). His final work as a professional actor was as host and performer on the popular Death Valley Days television series. Reagan's final big-screen appearance came in the 1964 film The Killers, a remake of an earlier version, based on a short story by Ernest Hemingway. Reagan portrayed a mob chieftain. This film, the first made-for-TV movie, was originally produced for NBC, but the network's censor found it too violent. Reagan's co-stars were John Cassavetes, Lee Marvin, and Angie Dickinson. In total Reagan boasts a fairly prodigious credit history of 102 activities ranging from Cowpoke to a cameo appearance in Spies Like Us. Reagan married actress Jane Wyman on January 24, 1940; they had a daughter, Maureen in 1941; an adopted son, Michael in 1945, and a second daughter, Christine, born and died June 26, 1947. They divorced on June 28, 1948. Reagan is the only United States President to date to have been divorced. Reagan remarried on March 4, 1952, to actress Nancy Davis. Their daughter Patti was born on October 21 of the same year. In 1958, they had a second child, Ron. Reagan was originally a Democrat, a supporter of Franklin D. Roosevelt and his New Deal, and a lifelong admirer of FDR's leadership skills. In the late 1940s, Reagan was still a visible speaker defending President Harry S. Truman. But his political loyalties changed after he felt that his party had changed. His first major political role was as president of the Screen Actors Guild (SAG), the labor union that represented most Hollywood actors, but which, he claimed, was being infiltrated by communists. In this position, he testified before the House Un-American Activities Committee (HUAC) on suspected communist influence in the motion picture industry. In private he and his first wife, Jane Wyman, met with FBI agents in 1947 to name "suspected subversives." Among those he allegedly fingered were actors Larry Parks, Howard Da Silva and Alexander Knox, each of whom was later called before HUAC and subsequently blacklisted in Hollywood. (This information was not revealed until a 2002 Freedom of Information Act request.) FBI files allegedly show that he continually gave the FBI names of people he suspected of communist ties. Now a staunch anti-communist, Reagan supported the presidential candidacies of Dwight D. Eisenhower (1952;1956) and Richard Nixon (1960), while remaining a registered Democrat. Through these years, Reagan read extensively on American history, the Founding Fathers and free market economics (Reagan had majored in economics in college). After reading Friedrich Hayek's "The Road to Serfdom," Reagan came to believe that socialism was a threat to the American way of life. Following the election of John F. Kennedy, whom Reagan called a socialist, he switched parties to become a Republican in 1962 — in time to mount the 1964 bandwagon of conservative Presidential contender Barry Goldwater. Speaking on Goldwater's behalf, Reagan revealed his ideological motivation: "The Founding Fathers knew a government can't control the economy without controlling people. And they knew when a government set out to do that, it must use force and coercion to achieve its purpose. So we have come to a time for choosing." "I didn't leave the Democratic Party," he claimed. "The party left me." Reagan later explained in his autobiography "An American Life" that Franklin D. Roosevelt warned that welfare programs could destroy the work ethic like "a narcotic" and that Roosevelt liquidated the temporary welfare programs designed to aid the country through the Great Depression once the Depression passed (only to be resurrected after Roosevelt's death). Predecessor: Edmund G. "Pat" Brown, Sr. Successor: Edmund G. "Jerry" Brown, Jr. In 1966, he was elected the 33rd Governor of California, defeating two-term governor Edmund G. "Pat" Brown, after working with UC Regent Edwin Pauley to crack down on anti-war protesters at UC Berkeley. He was re-elected in 1970, defeating "Big Daddy" Jesse Unruh, but chose not to seek a third term. Ronald Reagan was sworn in as governor of California on January 3, 1967. In his first term, he froze government hiring but also approved tax hikes to balance the budget. Reagan quickly squelched protest movements of the era. During the People's Park protests in 1969, he sent 2,200 state National Guard troops onto the Berkeley campus of the University of California. In a speech in April 1970, he stated, "If it's to be a bloodbath, let it be now. Appeasement is not the answer." He worked with Democratic Assembly Speaker Bob Moretti to reform welfare in 1971. Reagan also opposed the construction of a large federal dam, the Dos Rios, which would have flooded a valley of American Indian ranches. Later, Reagan and his family took a summer backpack trip into the high Sierra to a place where a proposed trans-Sierra highway would be built. Once there, he declared it would not be built. One of Reagan's greatest frustrations in office concerned capital punishment. He had campaigned as a strong supporter; however, his efforts to enforce the state's laws in this area were thwarted when the Supreme Court of California issued its People v. Anderson decision, which invalidated all death sentences issued in California prior to 1972, although the decision was quickly overturned by a constitutional amendment. Despite his support for the death penalty, Reagan granted two clemencies and a temporary reprieve during his governorship. As of 2006, no other clemency has been granted to a condemned person in California. The only execution during Reagan's governorship was on April 12, 1967, when Aaron Mitchell was executed by the state in San Quentin's gas chamber. There was not another execution in California until 1992. When the Symbionese Liberation Army kidnapped Patty Hearst in Berkeley and demanded the distribution of food to the poor, Reagan suggested that it would be a good time for an outbreak of botulism. After the media reported on the comment, he apologized. Reagan was the first governor to use a corporate business jet for official travel. California received one of the first Cessna Citation jets manufactured. His pilot, Bill Paynter, changed his Democratic voting registration to Republican within six months of meeting Reagan. Paynter often told listeners the Reagan on TV was the same Reagan in person, a man who walked his talk. Reagan would often ask his flight crew if it would be any inconvenience to change the published flight schedule because he did not want to keep his support staff from being with their families and any family planned events. Ronald Reagan on the cover of Time as "Man of the Year", 1980. Reagan first tested the Presidential waters in 1968 as part of a "Stop Nixon" movement which included those from the party's left led by then-New York Governor Nelson Rockefeller. Reagan managed to win the pledges of some 600 delegates, but Nixon quickly steamrolled to the nomination; Reagan urged the convention to nominate Nixon unanimously. In 1976, Reagan challenged incumbent President Gerald Ford, a moderate. Reagan soon established himself as the conservative candidate; like-minded organizations such as the American Conservative Union became the key components of his political base. He relied on a strategy crafted by campaign manager John Sears of winning a few primaries early to seriously damage the liftoff of Ford's campaign, but the strategy quickly disintegrated. Poor management of expectations and an ill-timed speech promising to shift responsibility for federal services to the states without identifying any clear funding mechanism caused Reagan to lose New Hampshire and later Florida. Reagan found himself cornered, desperately needing a win to stay in the race. Reagan's stand in the North Carolina primary was a do-or-die proposition. Hammering Ford on the Panama Canal, detente with the Soviet Union, busing of school children, and Henry Kissinger's performance as Secretary of State, Reagan won 53% to 47%. He used that bit of momentum to add the major states of Texas and California, but then fell back from losing efforts in Ohio, Tennessee, Kentucky and Michigan. As the party's convention in Kansas City neared, Ford appeared close to victory, thanks to New York, New Jersey and Pennsylvania delegates ostensibly under the control of Ford's liberal Vice President Rockefeller. Acknowledging the strength of his party's moderate and liberal wing, Reagan balanced his ticket by choosing as his running mate moderate Republican Senator Richard Schweiker of Pennsylvania. Nonetheless, Ford squeaked by with 1,187 delegates to Reagan's 1,070. Reagan's concession speech was a stirring exhortation, emphasizing the dangers of nuclear war and the moral threat posed by the Soviet Union. Although Reagan lost the nomination, he received 307 write-in votes in New Hampshire, 388 votes as an Independent on Wyoming's ballot, and an electoral delegate from Washington voted for him in the November election. In 1980, Reagan won the Republican nomination for President, handily winning most of the primaries after an early defeat in the Iowa caucuses. During the convention, Reagan proposed a complex power-sharing arrangement with Gerald Ford as Vice President, but nothing came of it. Instead, Reagan selected his opponent in the primaries, George H. W. Bush, who had extensive international experience. On August 4, 1980, Ronald Reagan, as a candidate, delivered a speech near Philadelphia, Mississippi at the annual Neshoba County Fair. Reagan excited the crowd when he announced, "I believe in states' rights. I believe we have distorted the balance of our government today by giving powers that were never intended to be given in the Constitution to that federal establishment." He went on to promise to "restore to states and local governments the power that properly belongs to them." Philadelphia was the scene of the June 21, 1964 murder of civil rights workers James Chaney, Andrew Goodman, and Michael Schwerner, and Reagan's critics alleged that the presidential candidate was signalling a racist message to his audience.The speech was in keeping with his philosophy of a limited federal government, but critics alleged that Reagan had chosen the site for the speech and had made his states' rights declaration implicitly to appeal to southern white voters. In his biography of Reagan, Edmund Morris states that Reagan was still a firm believer in the supremacy of the federal government. Reagan, who felt many of the major civil rights bills of the 1960s were unnecessary considering the already extensive civil rights protection already in the U.S. Constitution. Still, according to the book Running on Race: Racial Politics in Presidential Campaigns, when Carter tried to accuse Reagan of racism, because of his record, it largely backfired against Carter. When one of Carter's main black supporters, former U.N. Ambassador Andrew Young tried to whip up black opposition to Reagan by stating that if he were elected, it would be "okay to kill niggers" the strident language probably alienated more whites than it attracted blacks. The presidential campaign, led by William J. Casey, was conducted in the shadow of the Iran hostage crisis; every day during the campaign the networks reported on Carter's unavailing efforts to free the hostages. Most analysts argue this weakened Carter's political base and gave Reagan the opportunity to attack Carter's ineffectiveness. On the other hand, Carter's inability to deal with double-digit inflation and unemployment, lackluster economic growth, instability in the petroleum market leading to long gas lines, and the perceived weakness of the U.S. national defense may have had a greater impact on the electorate. Adding to Carter's woes was his use of the term "misery index" during the 1976 election, which he defined as the sum of the inflation and unemployment rates. This so-called "misery index" had considerably worsened during his term, which Reagan used to his advantage during the campaign. With respect to the economy, Reagan said, "I'm told I can't use the word depression. Well, I'll tell you the definition. A recession is when your neighbor loses his job; depression is when you lose your job. Recovery is when Jimmy Carter loses his." Reagan's showing in the televised debates boosted his campaign. He seemed more at ease, deflecting President Carter's criticisms with remarks like "There you go again." His most influential remark was a closing question to the audience, during a time of skyrocketing prices and high interest rates, "Are you better off now than you were four years ago?" (a phrase he would successfully reuse in the 1984 campaign). 1984 Presidential electoral votes by state. In the 1984 presidential election, Reagan was re-elected over former Vice President Walter Mondale, winning 49 of 50 states (Mondale carried only his home state of Minnesota and the District of Columbia). Reagan received nearly 60% of the popular vote. His chances of winning were not harmed when, at the Democratic National Convention, Mondale accepted the party nomination with a speech that was regarded as a self-inflicted mortal wound to his presidential aspirations. In it, Mondale remarked "Mr. Reagan will raise taxes, and so will I. He won't tell you. I just did." The campaign of 1984 also featured one of Reagan's most famous gaffes -- The infamous quotation "My fellow Americans, I'm pleased to tell you today that I've signed legislation that will outlaw Russia forever. We begin bombing in five minutes", jokingly spoken as a sound check prior to a radio address. Spoken during a time of great tension between the United States and the Soviet Union, it left many (particularly outside the United States) questioning Reagan's understanding of some of the realities of his foreign policy and of international affairs in general. Samples of the recording of the quotation were later turned into the dance record "Five Minutes" by Jerry Harrison and Bootsy Collins. Reagan accepted the Republican nomination in Dallas, Texas, on a wave of good feeling bolstered by the recovering economy and the dominating performance by the U.S. athletes at the Los Angeles Olympics that summer. He became the first American President to open a summer Olympic Games held in the U.S. Despite a weak performance in the first debate, Reagan recovered in the second and was considerably ahead of Mondale in polls taken throughout much of the race. Reagan's landslide win in the 1984 presidential election is often attributed by political commentators to be a result of his conversion of the "Reagan Democrats," the traditionally Democratic voters who voted for Reagan in that election. Reagan was an advocate of free markets and believed that the American economy was hampered by excessive economic controls and misguided welfare programs enacted during the 1960s and 1970s. In his first inauguration speech Reagan said, "In this present crisis, government is not the solution to our problem; government is the problem." His first act as president was to issue an executive order ending certain price controls. His supply-side economics policies, or "Reaganomics," achieved a 25% cut in the federal personal income tax, moderate deregulation and tax reform, which he believed would remove barriers to economic activity and lead to increased investments in the economy. He also supported and strengthened Social Security for the elderly, disabled and orphans to make it solvent longer. He wrote in his memoir "An American Life" that he was not trying to undo the New Deal. Instead, Reagan said he was trying to undo Lyndon Johnson's Great Society. The economy recovered robustly from the 1981-82 recession, and economic growth between 1982 and 1989 was an impressive 9.7% GDP without inflation. Reagan held an optimistic view of the American worker and economy. Despite his large tax cuts, spending grew unabated, resulting in a dramatic increase in federal budget deficits and the national debt. Reagan was skeptical of federal government programs to remedy socioeconomic problems. He was an advocate of individual initiative, and Reagan’s approach to America’s economic problems was to lower taxes and limit government controls, allowing the self-correcting "invisible hand" of the free market to assert itself. Speaking in front of the Berlin Wall on June 12, 1987 Ronald Reagan challenged reformist Soviet leader Mikhail Gorbachev to go further with his reforms and "tear down this wall." Many political and social commentators have credited Reagan with restoring a new optimism to the American psyche that had been mired in sullen negativity following the aftermath of the Watergate Scandal, the American withdrawal from Vietnam, and a 1970s economy plagued by spiraling inflation, unemployment and subsequent high interest rates. His ability to escape blame for numerous scandals that plagued his presidency earned him the nickname "The Teflon President." During his first term, Reagan wrote Abortion and the Conscience of the Nation, in which he advocated greater respect for human life. Reagan was reelected in a 49-state landslide in 1984. He did not succeed in substantially changing social policies, but he did change the way Americans viewed government and the economy. He is credited with achieving a less activist federal judiciary through conservative appointments to the United States Supreme Court and other federal courts. In foreign policy, his administration was noted for its boldness against communism and then skillful diplomacy in embracing the reformer Gorbachev. Dubbed "The Great Communicator," Reagan was known for his ability to express ideas and emotions in an almost personal manner, even when making a formal address. Reagan honed these skills as a radio host, actor, live television host and politician. As a young man he was inspired by FDR's bashing of Nazi Germany and spirited defense of democracy. He emulated FDR's speaking style, even swinging around a cigarette holder as he talked. In his autobiography, Reagan warmly recounted FDR's fireside chats, and he wrote that he borrowed from FDR's playbook when he took his case directly to the American people. Reagan as president used his communication skills to challenge the legitimacy of the Soviet Union, calling it "the evil empire," and to restore America's national pride. He hired skilled speechwriters who could capture his folksy charm. In 1985, Professor Max Atkinson who was to advise the British politician Paddy Ashdown on his speeches ran a seminar on speech writing in the White House. Reagan's rhetorical style varied. He used strong, even ideological language to condemn communism during his first term, but he could also evoke optimistic ideals of the United States as a defender of liberty. His October 27, 1964, speech entitled "A Time for Choosing" borrowed a phrase "rendezvous with destiny" made famous by Franklin D. Roosevelt. Other speeches recalled America as the "shining city on a hill", "big-hearted, idealistic, daring, decent, and fair," whose citizens had the "right to dream heroic dreams." It was perhaps Reagan's humor, especially his one-liners, that disarmed his opponents and endeared him to audiences the most. Discussion of his advanced age led him to quip in his second debate against Walter Mondale during the 1984 campaign, "I will not make age an issue of this campaign. I am not going to exploit, for political purposes, my opponent's youth and inexperience." On his career he joked, "Politics is not a bad profession. If you succeed there are many rewards, if you disgrace yourself you can always write a book." Both opponents and supporters noted his "sunny optimism", which was welcomed by many in comparison to his presidential predecessor, the often smiling, but serious, Carter. Reagan once said "The lessons of leadership were the same: hard work, a knowledge of the facts, a willingness to listen and be understanding, a strong sense of duty and direction, and a determination to do your best on behalf of the people you serve." In response to being dubbed the Great Communicator, he said in his Farewell Address: "I never thought it was my style or the words I used that made a difference: It was the content. I wasn't a great communicator, but I communicated great things..."
On March 30, 1981, Reagan, his press secretary James Brady, and two others were struck by gunfire from a deranged would-be assassin, John Hinckley, Jr.. Missing Reagan’s heart by less than one inch, the bullet instead pierced his left lung, which likely spared his life. Reagan joked to the surgeons, "I hope you're all Republicans" (though they were not, Dr. Joseph Giordano replied, "We're all Republicans today"). Reagan later famously told his wife, "Honey, I forgot to duck" (borrowing Jack Dempsey's line to his wife the night he was beaten by Gene Tunney for the heavyweight championship). Reagan had been scheduled to visit the City of Brotherly Love on the day of the shooting. He quipped to a nurse, "All in all, I'd rather be in Philadelphia," referring to the W.C. Fields' tagline (which was itself a reference to an old vaudeville joke among comedians: "I'd rather be dead than play Philadelphia") . A frequent objection by his critics was that his personal charm also permitted him to say nearly anything and yet prevail, a quality that earned him the nickname "The Teflon President" (nothing sticks to him). His denial of awareness of the Iran-Contra scandal belied his signing a secret presidential "finding" describing the deal as "arms-for-hostages." Critics objected to his comparison of the contras to the Founding Fathers and to the French Resistance, which suggests that he viewed the Sandinistas as Communists who were akin to an occupying power. The United States was found guilty of having supported terrorism in Nicaragua by the International Court of Justice (Nicaragua v. United States) during Reagan's presidency. Despite a United Nations General Assembly resolution demanding compliance, the U.S. never paid the required fine and since 1991, relations with Nicaragua were friendly. Economic inequality was increasing steadily after 1973 as the New Deal goal of egalitarianism faded from the political agenda. Reagan's efforts to cut welfare and income taxes became common flashpoints between critics who charged that this primarily benefited the wealthy in America, branding these policies as "Trickle-down economics", and the business community that said it penalized all American job seekers. The deregulation of the banking industry before Reagan took office, meant savings and loan associations were given the flexibility to invest their depositors' funds in commercial real estate. Many savings and loan associations began making risky investments. As a result, the Federal Home Loan Bank Board, the federal agency that regulates the industry, tried to clamp down on the trend. In so doing, however, the Board clashed with the policy of permitting the deregulation of many industries, including the thrift industry. The resulting savings and loan scandal bailout ultimately cost the government $150 billion. Reagan was criticized for the slow response of his Administration to the HIV-AIDS epidemic, until after the illness of movie star and national icon Rock Hudson became public news in late July 1985, by which time 12,067 Americans had been diagnosed with AIDS, and 6,079 had died..
Reagan's foreign policy drew criticism as a war-monger. In Britain, though Reagan had the strong support of Margaret Thatcher, he was routinely attacked for his foreign policies. Left-wing critics denounced his opposition to Castro's dictatorship in Cuba and complained that he was ignoring human rights in Central and South America, and South Africa. Although Reagan sought an end to apartheid and liberalization of South Africa, he opposed economic sanctions "on grounds that it would diminish influence on the South African government and create economic hardship for the very people in South Africa that the sanctions were ostensibly designed to help"
In 1983 and again in 1984, Reagan told prominent Israelis and American Jews -- notably Prime Minister Yitzhak Shamir of Israel and by Simon Wiesenthal and Rabbi Martin Hier of Los Angeles -- that he personally filmed the Auschwitz death camps; he was in a film unit in Hollywood that processed raw footage for newsreels, but he was not in Europe during the war. The Reagan administration saw several controversies unfold in their ranks which resulted in a number of administration staffers being convicted. The most well known, the Iran-Contra affair, involved a plan whereby weapons were sold to Iran and the profits diverted to fund the Nicaraguan Contras. 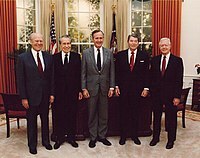 (Left to right:) Presidents Gerald Ford, Richard Nixon, George H. W. Bush, Ronald Reagan, and Jimmy Carter at the dedication of the Reagan Presidential Library. As the years went on, the disease slowly destroyed his mental capacity, forcing him to live in quiet isolation. On February 6, 2001, Reagan reached the age of 90 and was, at the time, only the third former US president to reach that age or higher - the other two being John Adams and Herbert Hoover with Gerald Ford later becoming the fourth, surviving to the age of 93. Since the former president had a hip operation three weeks prior to his 90th birthday and was suffering from Alzheimer's Disease for the past seven years, his 90th birthday was to be a low-key celebration with his family at his home in Bel-Air. Nancy Reagan, the wife of the former US president, told CNN's Larry King that very few visitors were allowed access to her husband because she felt that "Ronnie would want people to remember him as he was." Nancy Reagan went on to say that as the only ailment he had was the Alzheimer's disease he could live to be 100. People who had visited the former US president in his home said the disease was so well advanced that he was unable to recognize any of them and he could not remember anything about his days as US president. Reagan had an easy-going but deep Christian faith. His mother, an active Protestant, taught Reagan lasting values, such as a strong sense of personal responsibility and Christian tolerance for people of other faiths, cultures and colors. Reagan recalled in his autobiography An American Life that "my mother always taught us: 'Treat thy neighbor as you would want your neighbor to treat you,' and 'Judge everyone by how they act, not what they are.' He witnessed discrimination and was taught repeatedly that racism and was one of the worst sins possible. "My parents constantly drummed into me the importance of judging people as individuals," Reagan recalled. As an adult, Reagan was a member of Bel Air Presbyterian Church, but Reagan never attended church regularly, including during his presidency. In a March 1978 letter to a Methodist minister who was skeptical about Christ's divinity—and accused Reagan of a "limited Sunday school level theology"—Reagan argued strongly for Christ's divinity, using C.S. Lewis's Trilemma. Reagan believed that his presidency had a higher meaning to be treated as a temporary gift of responsibility. As an extention of that, Reagan had simple but firm convictions that formed his general policies while details were left to others. As president, Reagan spoke to numerous Christian groups and naturally attracted voters with traditional values. However, his son Ron Reagan said at his father's memorial service that he did not blatantly "wear his faith on his sleeve to gain political advantage." Numerous people reflected in their memoirs that President Ronald Reagan was personally one of the kindest men they had ever met. Even his political enemies found it hard to hate him, since he was so sincere and charming. Reagan's burial site is inscribed with words that President Reagan said at the opening of his presidential library: "I know in my heart that man is good. That what is right will always eventually triumph. And there’s purpose and worth to each and every life." Reagan died of pneumonia on June 5, 2004 at 1:09 PM PDT at his home in Bel-Air, California. After a major state funeral in Washington that drew leaders from around the world, he was buried at the Ronald Reagan Presidential Library in Simi Valley, California. The state funeral was presided over by President George W. Bush, whose father was vice-president under Reagan and followed Reagan to the White House. Reagan is often referred to as the Gipper, referring to his performance as George Gipp in the film Knute Rockne, All American, often along with his popular line "Win one for the Gipper." As a youth he was called "Dutch," a nickname given him by his father. As President, he became known as "The Great Communicator" and "The Teflon President." His Secret Service codename was "Rawhide." Detractors sometimes referred to Reagan as "Ronald Ray-Gun," a term coined in the introduction to the song Drug Store Truck Drivin' Man sung by Joan Baez and Jeffrey Shurtleff at the 1969 Woodstock Festival. The US Postal Service commemorated Reagan with a postage stamp in 2006. In a 1995 poll of 2,307 coin collectors by the Littleton Coin Company, Reagan was ranked as the figure most likely to appear on a future U.S. coin (Reagan appeared on a non-circulating dime in 2006). 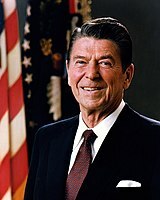 On June 26, participating voters selected Reagan as the "Greatest American" during a live television special sponsored by AOL and broadcast live on the Discovery Channel. These and other honors were, as one reporter noted, "a final win for the Gipper." In 2002, Congress authorized the creation of Ronald Reagan Boyhood Home National Historic Site in Dixon, Illinois, pending federal purchase of the property. In 2004, the Illinois State Toll Highway Authority voted to rename Interstate 88, which was formerly called the East-West Tollway, in his memory. In 2006, in Doral, Florida, a new high school was named after him. Its full name is Ronald W. Reagan High. United States Military Academy's Sylvanus Thayer Award. In 1989, Reagan received a honorary British knighthood, Knight Grand Cross of the Order of the Bath. This entitled him to the use of the post-nominal letters GCB but did not entitle him to be known as "Sir Ronald Reagan." He, Dwight D. Eisenhower and George H.W. Bush are the only American Presidents to have received the honor. On May 16, 2002 Nancy Reagan accepted the Congressional Gold Medal, the highest civilian honor bestowed by Congress, on behalf of the President and herself. "True Grit", Ronald Reagan (CMT), 2005. Ronald Reagan - An American President (The Official Reagan Library Tribute), January 25, 2005. Great Speeches, October 19, 2004. Stand Up Reagan, September 7, 2004. NBC News Presents - Ronald Reagan, August 10, 2004. ABC News Presents Ronald Reagan - An American Legend, July 13, 2004. Ronald Reagan - His Life and Legacy, June 22, 2004. Ronald Reagan - His Life and Times, May 11, 2004. Ronald Reagan - A Legacy Remembered (History Channel), 2002. Ronald Reagan - The Great Communicator, 2002. Salute to Reagan - A President's Greatest Moments, 2001. American Experience - Reagan, 1998. Tribute to Ronald Reagan, 1996. The Reagan Legacy, (Discovery Channel) 1996. In the Face of Evil: Reagan’s War in Word and Deed, 2004. Bryan Clark has appeared several times as Reagan including HBO's Without Warning: The James Brady Story with Beau Bridges as James Brady; and also in Guts and Glory: The Rise and Fall of Oliver North. John Roarke on the sketch comedy series Fridays and on a Christmas episode of Fresh Prince of Bel-Air as one of the Banks' neighbors. Reagan was the oldest man ever elected president at 69 years of age. He broke the record set in 1840 when William Henry Harrison was elected at 67 years of age and inaugurated at 68 years of age. Reagan also was the oldest president to serve at 77, surpassing Dwight Eisenhower, who was 70 when he left office in 1961. Reagan also had lived the longest of any former president until November 11, 2006, when he was surpassed by Gerald Ford. In 2001, Reagan had broken the previous record held by John Adams the second president who died on July 4, 1826. Reagan was the first film or television actor to become U.S. president. As a card-carrying member of the Screen Actors Guild, Reagan also has the distinction of being the only trade union member ever elected president. Reagan was the first president to be divorced. Reagan was the 40th president to serve, but in birth order was the 35th, born in 1911. Lyndon B Johnson, born in 1908, was the 34th in birth order. Richard Nixon, born in 1913, was the 36th president in birth order, the 37th to serve and the 36th to die. Reagan was also older than the previous 3 former presidents (Nixon, Ford, and Carter) and one additional late president, John F Kennedy. Reagan was left-handed, although he was usually shown writing with his right hand. When throwing out the ceremonial first ball before baseball games, he threw with his right arm, like he did in the baseball film The Winning Team. For a 1964 film, The Best Man, Reagan was rejected for a part due to "not having the presidential look". Reagan was 6 feet 1 inch (182.5 cm) tall. Ronald Reagan was twice chosen by Time Magazine as the Person of the Year: in 1980 (after first winning the Presidency) and in 1983 (together with then Soviet leader Yuri Andropov). In Gallup's List of Widely Admired People, Reagan was ranked the 15th most admired person in the 20th century. Reagan was the first United States president to die in the 21st century. Collins, Chuck, Felice Yeskel, and United for a Fair Economy. "Economic Apartheid in America: A Primer on Economic Inequality and Insecurity." (2000). on tax policies. Cook, Daniel M. and Polsky, Andrew J. "Political Time Reconsidered: Unbuilding and Rebuilding the State under the Reagan Administration." American Politics Research(4): 577-605. ISSN 1532-673X Fulltext in SwetsWise. Argues Reagan slowed enforcement of pollution laws and transformed the national education agenda. Dallek, Matthew. The Right Moment: Ronald Reagan's First Victory and the Decisive Turning Point in American Politics. (2004). Study of 1966 election as governor. Ferguson Thomas, and Joel Rogers, Right Turn: The Decline of the Democrats and the Future of American Politics 1986. Germond, Jack W. and Jules Witcover. Blue Smoke & Mirrors: How Reagan Won & Why Carter Lost the Election of 1980. 1981. Detailed journalism. Greffenius, Steven. The Last Jeffersonian: Ronald Reagan's Dreams of America. June, July, & August Books. 2002. Jones, John M. "'Until Next Week': The Saturday Radio Addresses of Ronald Reagan" Presidential Studies Quarterly. Volume: 32. Issue: 1. 2002. pp 84+. Kengor, Paul. God and Ronald Reagan: A Spiritual Life Regan Books, 2004. ISBN. Meyer, John C. "Ronald Reagan and Humor: A Politician's Velvet Weapon," Communication Studies): 76–88. Patterson, James T. Restless Giant: The United States from Watergate to Bush vs. Gore. (2005), standard scholarly synthesis. Salla; Michael E. and Ralph Summy, eds. Why the Cold War Ended: A Range of Interpretations Greenwood Press. 1995. Shogan, Colleen J. "Coolidge and Reagan: The Rhetorical Influence of Silent Cal on the Great Communicator," Rhetoric & Public Affairs 9.2 online at Project Muse; argues that Coolidge and Reagan shared a common ideological message, which served as the basis for modern conservatism. Even without engaging in explicitly partisan rhetoric, Reagan's principled speech served an important party-building function. Strock, James M. Reagan on Leadership: Executive Lessons from the Great Communicator (1998) Examination of Reagan's leadership and management style. Troy, Gill. Morning in America: How Ronald Reagan Invented the 1980s (2004). Study of Reagan's image. Weatherford, M. Stephen and Mcdonnell, Lorraine M. "Ronald Reagan as Legislative Advocate: Passing the Reagan Revolution's Budgets in 1981 and 1982." Congress & the Presidency(1): 1-29. Fulltext in Ebsco; Argues RR ignored the details but played a guiding role in setting major policies and adjudicating significant trade-offs, and in securing Congressional approval. Arnson, Cynthia J. Crossroads: Congress, the Reagan Administration, and Central America Pantheon, 1989. Busch, Andrew E.; "Ronald Reagan and the Defeat of the Soviet Empire" in Presidential Studies Quarterly. Vol: 27. Issue: 3. 1997. pp 451+. Dobson, Alan P. "The Reagan Administration, Economic Warfare, and Starting to Close down the Cold War." Diplomatic History(3): 531-556. Fulltext in SwetsWise, Ingenta and Ebsco. Argues Reagan's public rhetoric against the USSR was harsh and uncompromising, giving rise to the idea that his administration sought to employ a US defense buildup and NATO economic sanctions to bring about the collapse of the USSR. Yet many statemnents by Reagan and Shultz suggest they desired negotiation with the Soviets from a position of American strength, not the eventual demise of the USSR. Fitzgerald, Frances. Way Out There in the Blue: Reagan, Star Wars and the End of the Cold War. political history of S.D.I. (2000). ISBN. Ford, Christopher A. and Rosenberg, David A. "The Naval Intelligence Underpinnings of Reagan's Maritime Strategy." Journal of Strategic Studies(2): 379-409. Fulltext in Ingenta and Ebsco; Reagan's maritime strategy sought to apply US naval might against Soviet vulnerabilities on its maritime flanks. It was supported by a major buildup of US naval forces and aggressive exercising in seas proximate to the USSR; it explicitly targeted Moscow's strategic missile submarines with the aim of pressuring the Kremlin during crises or the early phases of global war. The maritime strategy represents one of the rare instances in history when intelligence helped lead a nation to completely revise its concept of military operations. Pach, Chester. "The Reagan Doctrine: Principle, Pragmatism, and Policy." Presidential Studies Quarterly(1): 75-88. Fulltext in SwetsWise and Ingenta; Reagan declared in 1985 that the U.S. should not "break faith" with anti-Communist resistance groups. However, his policies varied as differences in local conditions and US security interests produced divergent policies toward "freedom fighters" in Afghanistan, Nicaragua, Mozambique, Angola, and Cambodia. Wills, David C. The First War on Terrorism: Counter-Terrorism Policy during the Reagan Administration. 2004. FitzWater, Marlin . Call the Briefing! Bush and Reagan, Sam and Helen, a Decade with Presidents and the Press. 1995. Memoir by press spokesman. Edmund Morris. Dutch: A Memoir of Ronald Reagan. 2000. Reagan's authorized biographer. Michael Deaver and Mickey Herskowitz. Behind the Scenes. 1987. Memoir by a top aide. ^ Reagan, FBI, CIA tried to quash campus unrest - June 8, 2004, AP and USA Today. ^ Quoted by Ron Paul Remembering Ronald Reagan in the Congressional Record, June 9, 2004. ^ Los Angeles Times obituary. ^ Los Angeles Times, April 8, 1970, page 3. Later in April 1970, a young man who was aiding police was accidentally shot during a riot in Isla Vista, California. Reagan then blamed the death of the young man on the rioters; Los Angeles Times, April 22, 1970, page 1. ^ Los Angeles Times, Mar. 7, 1974, p. A25. ^ in ^ The Boys of Pointe du Hoc: Ronald Reagan, D-Day, and the U.S. Army 2nd Ranger Battalion, Douglas Brinkley (2005). ^ Reagan, Ronald. Farewell Address (January 11, 1989). ^ Weisman, Jonathan (9 June 2004) "Reagan Policies Gave Green Light to Red Ink." Washington Post; A11. ^ Donald T. Regan, "For the Record"
^ Morris, Edumund. Dutch: A Memoir of Ronald Reagan (2000) p.465. Cannon, Lou. President Reagan: The Role of a Lifetime (2000) p. 428-30. ^ President Reagan: The Triumph of Imagination, Richard Reeves (2005). ^ ^ ^ Sussman, Dalia (2001-08-06). Improving With Age: Reagan Approval Grows Better in Retrospect (English). ABCNEWS.com. Retrieved on 2006-09-12.